FORT MCDOWELL INDIAN RESERVATION, Ariz. (AP) — Authorities say a helicopter has crashed on the outskirts of Phoenix and news video showed wreckage and an apparent burned area in a farm field. According to the Fort McDowell Fire Department, two people are dead: Rucie Moore, professor and helicopter program chair at Embry-Riddle University, and Stephen Estes, engineering manager at Van Horn Aviation. Authorities revealed witnesses heard a boom and looked up and saw helicopter falling. The Federal Aviation Administration said the helicopter was a Bell 206B and the pilot had departed from Falcon Field. Moore had been a full-time faculty member at Embry-Riddle for about one year. Before that, he spent five years as an adjunct professor for both the Embry-Riddle Prescott and Worldwide campuses. Before Embry-Riddle, Moore was a helicopter test pilot for the U.S. Army. Estes, an Arizona State University alumnus with a master of aerospace engineering degree, had been on VHA's engineering staff for five years. VHA said Estes was instrumental in the design and analysis of current rotor blades. He was recently promoted to engineering manager. VHA said its representatives have reached out in support of the crewmembers' families and are working with authorities in the investigation of the crash. 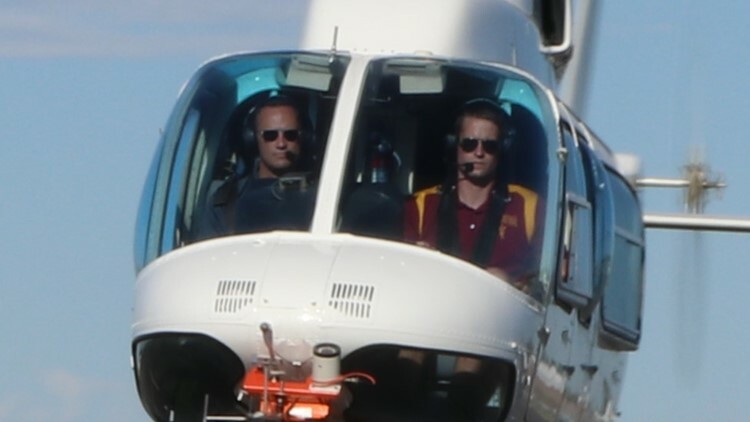 (left to right) Rucie Moore and Stephen Estes during a 206L demo flight.